For the last two weeks Carlos Buhler and I have wanted to climb Marion Falls (100 m, III, WI5) in Johnson Creek which is located in a remote part of The Ghost. On our first visit we hiked into the wrong valley (the Hydrophobia valley) and thus didn't have time to climb the route when we finally found it (read the story here). On our second visit four days later we drove all the way into the correct valley with Carlos' 4WD truck suited with snow chains, parked right a the foot of the neighboring Caroline Falls (50 m, III, WI5), but then retreated due to bad weather before we even left the car (read that story here). Today we made our third attempt on the route and were finally successful. Carlos once again managed to drive his truck all the way to the base of the climb (3.5 hours from Canmore) which left us with just 15 min approach. 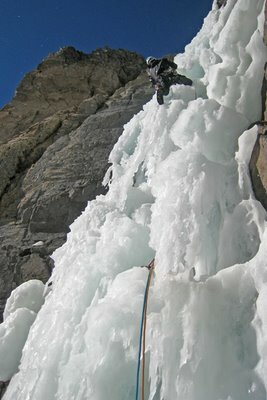 We initially soloed a short ice step at the base of the canyon where after I led a WI3 pitch to the base of the crux pillar. The overhanging mushrooms looked pretty scary and the 4-8 °C and bright sun on the route created a rain shower on the route. However, the warm temperatures also created very plastic ice which was easy to get good ice axe placements in. I made a solid anchor with two ice screws in shaded ice and a threaded icicle where after Carlos came up. He took a good look at the overhanging mushrooms and visualized the easiest route past them. He was thus able to navigate past them leaving only one overhanging move. 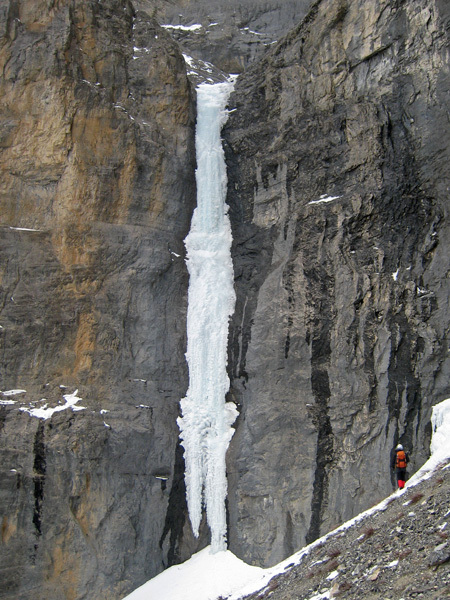 After the 15 meters of mushrooms followed a vertical sheet of ice of 20 meters. 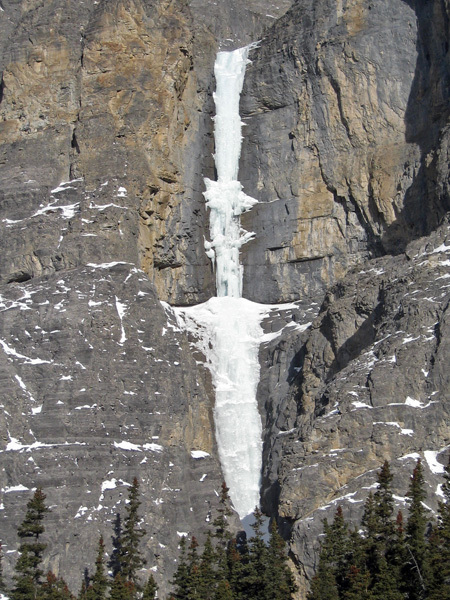 The relative shortness of the crux pillar probably account for the low grade of WI5 - hard Canadian grading as always! 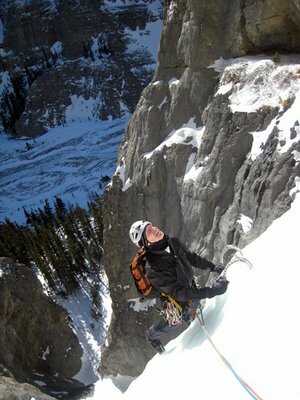 Soon it was my term to follow and the mushrooms offered some of the most enjoyable ice climbing I have done so far. Very technical climbing and it was just awesome to stand on the mushrooms and look down into absolutely free air. Newer tried that on ice before! The only problem was the water dripping from the mushrooms which fell into my eyes each time I looked up - certainly didn't make the climbing easier! After the crux pitch we saw another WI3 pitch further up the ice flow which was not described in the guide book. We looked at each other and said "why not - we will probably newer come up here again!". 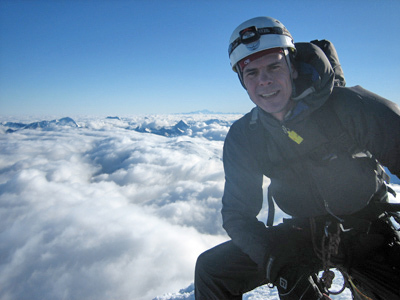 I thus lead another pitch of enjoyable climbing. It had taken us less time to climb the route than anticipated and back at the car we thus quickly agreed to give the neighboring route Caroline Falls (50 m, III, WI5) a go. However, on the short drive to that route, we high centered the truck on rock and snow and thus had to get the shovels out. 20 min later the car was free - great for a second I feared that we lost the chance to climb the route. Another 15 min later we were at the base of Caroline Falls which is just one long pitch of 3 vertical ice sections intersected by easier steps which provided good rests. The first vertical section of 10-15 meters was on thin half rotten ice which was detached from the rock. Ice screws would thus not provide any protection and I thus chose to take comfort in the snow field below working as a crash pad. Luckily, the ice was plastic and thus relatively easy to climb. I was however relieved when I got to the step before the next vertical section which finally provided good ice for protection. Nice feeling to put in the first ice screw! After that section the pitch was easy going with good ice for my tools, crampons and ice screws. It was really nice to climb these two routes. It was quite obvious that the routes were not climbed very often due to the remote location (my guess is that we were the first this season). That's too bad as both routes are of a very high class. So go climb 'em! Marion Falls. The crux is the overhanging mushrooms in the middle of the route. Carlos at the top of the initial WI3 pitch looking for the best line past the mushrooms. Carlos leading the mushroom crux. 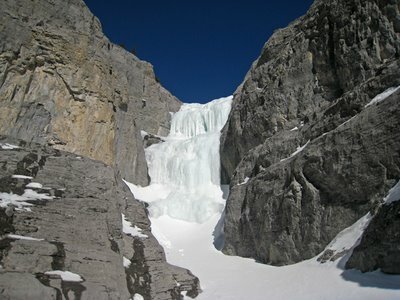 The third WI3 pitch of Marion Falls, which is not visible from the base of the route. Carlos preparing an abalakov anchor. Note the beautiful surroundings! Carlos at the base of Caroline Falls. 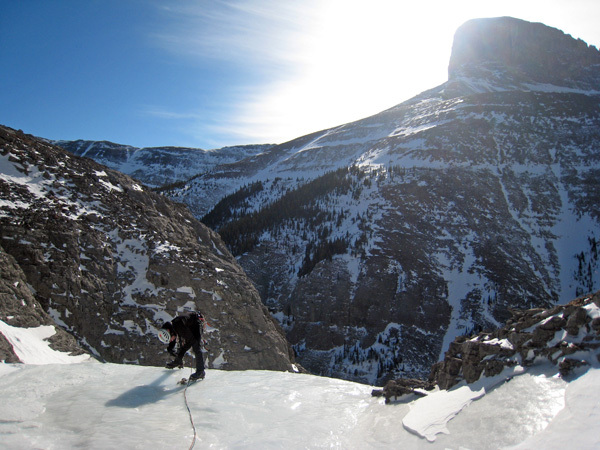 The author above the crux of Caroline Falls - relieved after just having put his first ice screw in.